The Ira Twin Bedroom Group by Acme Furniture at Del Sol Furniture in the Phoenix, Glendale, Tempe, Scottsdale, Avondale, Peoria, Goodyear, Litchfield, Arizona area. Product availability may vary. Contact us for the most current availability on this product. 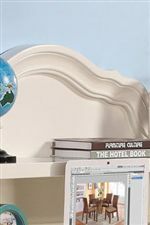 The Ira youth bedroom collection reflects romantic styling, updated features, and traditional classicism to celebrate the princess in your life, starting with the Ivory Pearl wood finish found on the gorgeous bed. Crown detailing and a button-tufted upholstered headboard and footboard give a regal opulence to the piece. 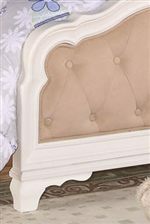 Scalloped edges and antiqued pull hardware complete the look and will bring a grandiose palatial atmosphere to any youth bedroom for a fraction of the cost! A desk with hutch and side chair gives your child the perfect place to work on homework and study for quizzes and exams. Storage drawers abound throughout the Ira collection, helping keep your youth's space organized and clutter-free! Sleigh style legs and low-to-the-ground styling are exquisitely crafted to create pieces that are durable and lasting. You and your child will love this bedroom collection fit for royalty! The Ira collection is a great option if you are looking for Traditional furniture in the Phoenix, Glendale, Tempe, Scottsdale, Avondale, Peoria, Goodyear, Litchfield, Arizona area. Browse other items in the Ira collection from Del Sol Furniture in the Phoenix, Glendale, Tempe, Scottsdale, Avondale, Peoria, Goodyear, Litchfield, Arizona area.